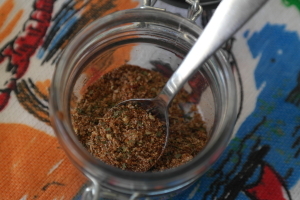 I’ve been using Mexican Seasoning with abundance lately, I can’t get enough of it. We’ve been having a lot of BBQs and it’s sensational as a rub on all meats and I have been whipping up a lot of Mexican dishes requiring it (cue: Mexican Street Corn and Chopped Mexican Salad). I just can’t bring myself to buy it when surely, with my excessive collection of herbs and spices, I have all the base ingredients? Besides, it’s dead easy and you’ll save yourself some pennies! Here’s my Mexican seasoning recipe. Enjoy! Combine the following ingredients in a jar and give it a good shake. Done! I use this as a rub on chicken, beef, fish and to liven up any chilli concoction. It’s also delicious sprinkled over roast potatoes halfway through their cooking time!